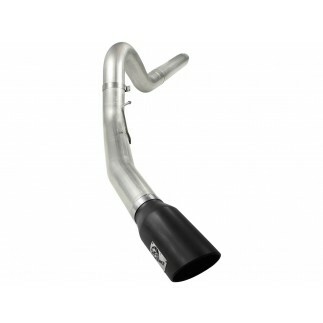 Afe's 2008-2010 Powerstroke Diesel Intercooler Tube is constructed of 3" mandrel bent powder-coated stainless steel tubing for maximum flow. Smooth transition bends decrease turbulence, increasing horsepower, torque and reduced exhaust gas temperatures. Installs on the Cold Side (Passenger-Side) to transfer cooled air smoothly to the motor. This intercooler tube lines up directly to factory mounting locations and comes complete with high-temp silicone couplings, hoses and premium stainless steel T-bolt clamps used to securely mount the tube. Whether you have upgraded to aFe's BladeRunner Intercooler or OE, this intercooler tube will work great. A unique stainless steel laser-cut aFe power logo plate is welded-on for an aggressive style. Two 1/8" NPT ports are provided for user convenience, connecting things like temperature sensors or methane injection accessories, etc. Note: Trimming of the radiator core support bracket is required.